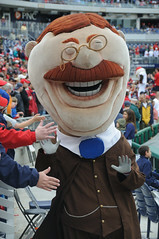 Nationals again offer coupon code to Teddy fans for this week’s series vs. Giants | Let Teddy Win! The Washington Nationals have once again released a coupon code “for Teddy’s friends”: Order online at Nationals.com using Coupon Code “TEDDY” and get half-price tickets in select seating sections for this week’s 3-game series vs. the San Francisco Giants. It’s a great chance to catch reigning Cy Young award winner Tim Lincecum (on the mound tonight), or watch future Hall-of-famer Randy Johnson go for win #300 (tomorrow night). Note also that $5.00 walk-up grandstand tickets have been readily available before the game before the game at the Nationals ticket office outside the Center Field Gate.